Imagine pulling up to a beautiful antebellum-style boutique hotel with classic style that captures you at first sight. Upon entering the two-story lobby, guests are surrounded by breathtaking architecture, timeless beauty, and old world charm. The Campbell House Curio, A Collection by Hilton, welcomes visitors to a destination where rich history, exceptional service, modern luxury, and classic elegance exist in perfect harmony. 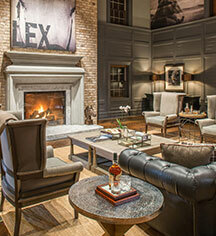 Nestled in the heart of horse country, The Campbell House is a historic, boutique hotel in Lexington, Kentucky. For over half a century, world leaders, equestrian enthusiasts, business travelers, lovely brides, and numerous groups have chosen The Campbell House in Lexington, Kentucky as a place of refuge, renewal, and rejuvenation. Originally built as a small two-story building in 1949, The Campbell House is Lexington’s most recognized and cherished hotel. A recent multi-million dollar renovation has transformed this local jewel into one of the finest hotels in Kentucky. Featuring 250 guestrooms and suites, and 18,000 square feet of flexible function space, The Campbell House can accommodate everything from board meetings to conventions. The hotel is the perfect location for business travel, groups, meetings, and social events. Convenient and centrally located near downtown, the hotel is just 4 miles from the legendary Keeneland Racecourse and Blue Grass Airport. 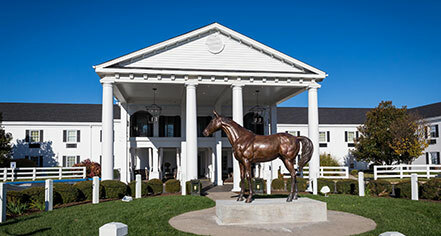 The Campbell House is moments away from the Kentucky Horse Park, University of Kentucky, local corporate parks, government offices, St. Joseph’s Hospital, and other medical facilities. It is also near many local dining, shopping, and entertainment venues. Whether seeking a personalized experience for a business trip, an inspirational setting for a meeting, or the perfect backdrop for an unforgettable wedding, your adventure into a world of beauty, luxury, and tranquility awaits at The Campbell House Curio, A Collection by Hilton. The Campbell House Curio, a member of Historic Hotels Worldwide since 2016, dates back to 1949. A group from the Lexington Junior League Horse Show sneaked a winning horse into the hotel so it could drink champagne from a bathtub. Airport Transportation: Free airport transportation. Parking: Self-parking: Available; complimentary. Valet: Not Available. Secured: Not Available. Covered: Not Available. In/Out Privileges: Not Available. Payment: Accepted Payment Options: American Express, Diners Club, Discover, JCB, MasterCard, and Visa. Imagine pulling up to a beautiful antebellum-style boutique hotel with classic style that captures you at first sight. Upon entering the two-story lobby, guests are surrounded by breathtaking architecture, timeless beauty, and old world charm. Learn more about the History of The Campbell House Curio, A Collection by Hilton .